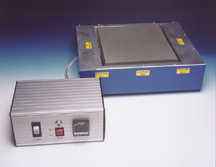 Our Model HP-1010-P-400 Hot Plate is ideal for large or small systems and modules or SMD circuit, Hybrid circuits, substrates for sealing, pre-heating, curing epoxy, soldering parts or processing with controlled temperature. Hot Plates are an excellent tool for Repair/Rework of substrates and electrical components. This Hot Plates has a heated area of 10 inch x 10-1/2 inch. Temperature Range Ambient to 400 Deg C, Digital PID Temperature Control with Alarm, 5 inch High Profile, 120 Volts, 20 Amps, 220 volts 10 amps. Double Frame and safety interlock to keep the frame temperature cool during all temperatures. Our Industrial Laboratory Hot Plate can be ordered with different Top Plate of Teflon Anodized Aluminum, Bare Aluminum, Electroless Nickel Aluminum or Stainless Steel. The Hot Plate has a flatness of +/-0.005", Temperature accuracy is +/- 2 deg C. Higher Temperature are available per request.